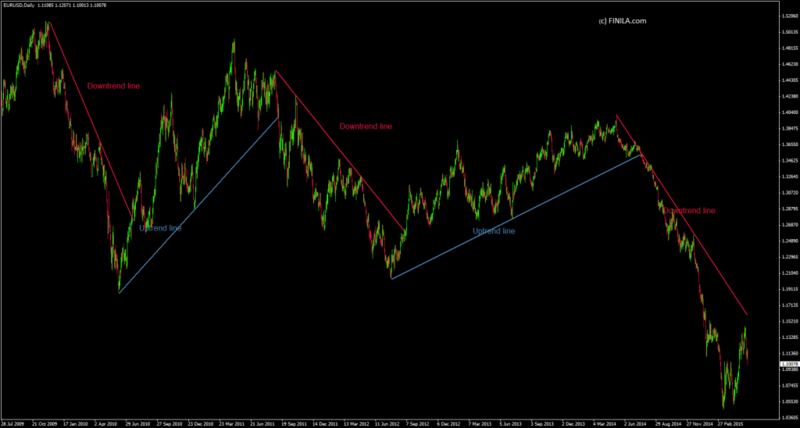 Trend Lines are an important tool in technical analysis for both trend identification and confirmation. A trend line is a straight line that connects two or more price points and then extends into the future to act as a line of support or resistance. The general rule in technical analysis is that it takes two points to draw a trend line and the third point confirms the validity. Uptrend lines are drawn under the rising stock chart lows. An uptrend line has a positive slope and is formed by connecting 2 or more low price points. The 2nd low must be higher than the 1st for the line to have a positive slope. Uptrend lines act as support and indicate that net-demand (demand minus supply) is increasing even as the price rises. A rising price combined with increasing demand is very bullish, and shows a strong determination on the side of the buyers. As long as prices remain above the trend line, the uptrend is considered solid and intact. A break below the uptrend line indicates that net-demand has weakened and a change in trend could be imminent. Downtrend lines are drawn above the declining stock chart highs. A downtrend line has a negative slope and is formed by connecting 2 or more high price points. The 2nd high must be lower than the 1st for the line to have a negative slope. Downtrend lines act as resistance, and indicate that net-supply (supply minus demand) is increasing even as the price declines. A declining price combined with increasing supply is very bearish, and shows the strong resolve of the sellers. As long as prices remain below the downtrend line, the downtrend is solid and intact. A break above the downtrend line indicates that net-supply is decreasing and that a change of trend could be imminent. The lows used to form an uptrend line and the highs used to form a downtrend line should not be too far apart, or too close to each other. Sometimes there appears to be the possibility for drawing a trend line, but the exact points do not match up clearly. The highs or lows might be out of whack, the angle might be too steep or the points might be too close to each other. If 1 or 2 points could be ignored, then a fitted trend line could be formed. With the volatility presence in the market, prices can over-react, and produce spikes that distort the highs and lows. One method for dealing with over-reactions is to draw internal trend lines. Even though an internal trend line ignores price spikes, the ignoring should be within reason. Sometimes, there is a price cluster with a high or low spike sticking out. A price cluster is an area where prices are grouped within a tight range over a time period. The price cluster can be used to draw the trend line, and the spike can be ignored.